I’ve been putting off posting pictures of the latest incarnation of our front garden. I kept thinking it would be better ‘next week’ well, I’ve finally came to terms with the fact that I hate it. I loved it 2 years ago. That version was what I designed and loved, the plants were mature and looking fabulous. 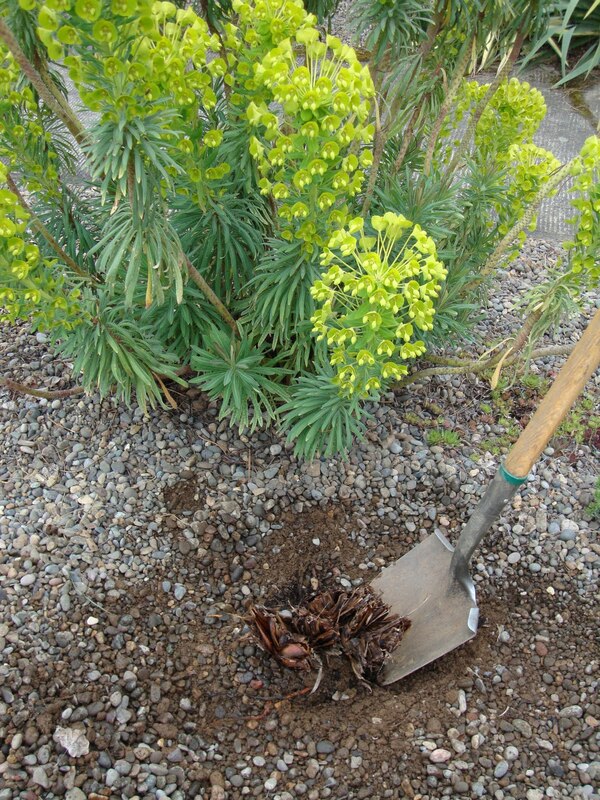 Then two back to back harsh winters killed plants that had previously been hardy in Portland for years. It was time to start over. For example the Phormium would not be replanted. Here are their remains, behind the blooming Euphorbia. Likewise the remaining Cordylines would live or die but never again would I replant them. So what to go forward with? I’d been flirting with Manzanita and Ceanothus in others gardens. It was finally time to invite them into mine. But the plants I’ve purchased are small. I had gotten used to BIG, and now I am starting over. 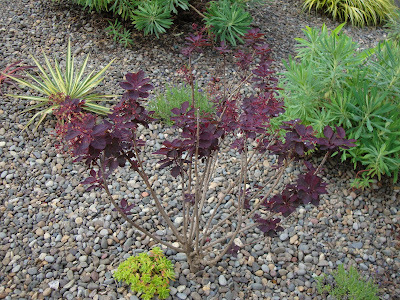 Another long term crush, Cotinus. I’ve loved the foliage on this dark stunner for years. Finally I’ve planted one in my garden. Please grow little Cotinus grow! 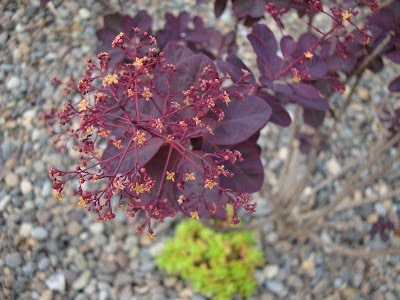 Since the Euphorbia on the south-end are evergreen, and their chartreuse blooms in the spring last for weeks and weeks, that’s where the Cotinus was planted. The contrast between the dark burgundy leaves and the chartreuse blooms will be fabulous! 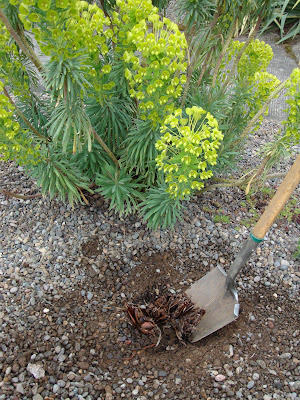 And since the Cotinus is deciduous the Euphorbia will carry that end of the garden through the winter months. Add Yucca 'bright star,' Yucca filamentosa 'Color Guard,’ Eryngium Yuccifolium and Euphorbia rigida and there is (or will be) plenty of interest to carry the south end of the garden. And as bonus the Yucca 'bright star' which has never looked particularly good since the day I planted it is having babies! The Manzanita… Arctostaphylos densiflora 'Harmony' anchors the north end. Or hopefully it will, some day. Right now its just couple of perky little twigs that you can barely make out above the Tetrapanax leaves. 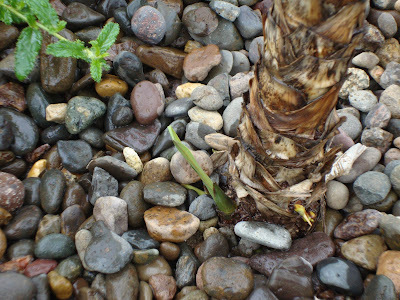 As you saw above in the northeast corner the Tetrapanax I planted last fall is coming on strong. 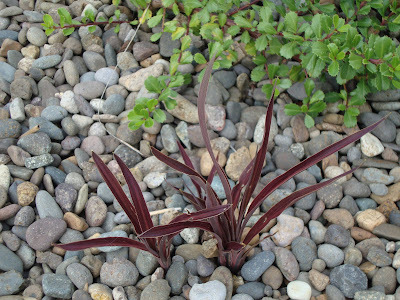 Joining it are purple Yucca (left), a Ceanothus Pt. 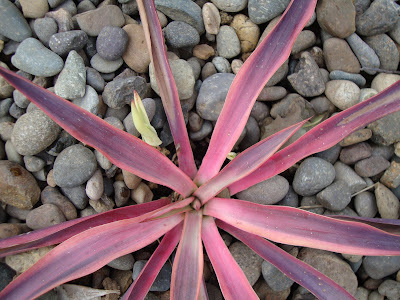 Reyes (right) and a surprise come back…a purple Cordyline that collapsed last winter. Proving sometimes it’s smart to leave the roots of a marginally hardy plant that appears dead in the ground to see what might happen. The northwest corner is now a mash up of two different Ceanothus (Ceanothus ‘Joyce Coulter’ and Ceanothus ‘I can’t remember’), a few Verbascum, another purple Yucca, Flax (sucker! 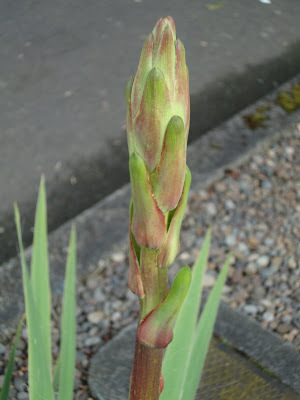 Yes I bought just one more…it was cheap at Means Nursery…) and the surviving, still standing Cordy. And guess what! It’s got new leaves pushing out of the center and a sprout coming out of the side. This is a survivor. In previous summers the center of the garden quite literally erupted in a display of tall colorful Canna Liliys, several different types. However these too fell to the nasty winter and only a few are struggling back this year. 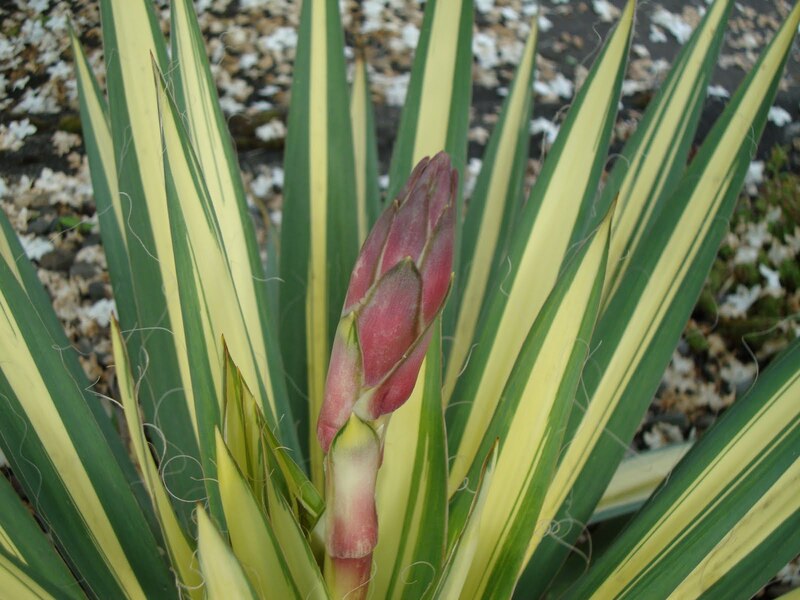 As previously revealed I planted three agaves here. And yes, I have corrected the horrible offense of the WWTT 3 post. Yhey still look a little dorky in this picture, 'real life' is better. The huge leaves of a Euphorbia stygiana. So…back to that ‘hate it’ sentiment. If I put on my magical future glasses (fast forward 3 years) then I love it! But right now…not so much. Everything is so small. I’ve stepped back years…no fun when its size (that only age can bring) which you want! I really need to put more thought into my gardens...I buy, I plant, I complain! This garden is so neat. Love Euphorbia of any kind. Isn't it exciting to watch the babies mature over a few years? Great job! I hope you'll be gratified with how quickly the ceanothus and manazitas take off. They're both such fast growers. My yucca "Bright Edge" is sending up a bloom stalk, and having a baby too! 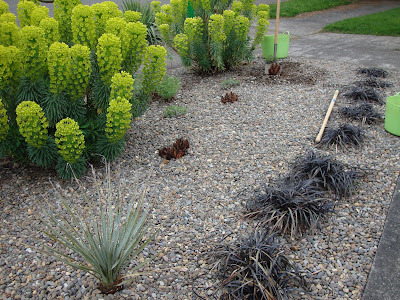 I think I need more yuccas - they're tough. That really stinks to lose beloved plants like that. And here I've pulled phormiums out because they got too big! If it's any consolation, your euphorbias are some of the best I've seen. I never get that big uniformity of bloom from E. characias. Aren't we always suffering either from blank spaces or from overcrowding? Put on those rose-colored glasses, Loree...and a glass of wine always helps, too. To me, your garden always looks fabulous. We in Austin feel your pain after a surprisingly harsh winter killed off previously hardy plants. Two in a row is even worse (will that be our fate next winter?). But the silver lining is getting to make a new start or move in a new direction and, best of all, getting to try new plants. Hmmm, I'm not sure what happened there. So I hope this isn't a double post. But, I love your gardens. You can see that they have taken a lot of thought and planning, and you have done a fabulous job (despite those wild winters we had). I know I've said it before but I love, love, love your river rock! Well, it certainly is true that a garden is always evolving, isn't it? I enjoyed seeing your Yuccas, especially with baby ones on the way. I enjoy hearing the story behind a garden and seeing the bigger picture. The euphobias are lovely. I hope to do a post soon on my tetrapanax, which has reached epic size. Darla, thank you. But I really think gardens that just evolve are the best kind. MulchMaid, misery loves company right? I'm sad for you but glad to know there are others who know what I am feeling. I hope you will post a few pictures of your 'bright edge' bloom! Denise, thank you, actually it is a bit of a consolation. I have my Phormiums in containers to satisfy that need...I just miss the big ones so! Thank you ricki...and I'm pouring that glass of wine right now! Laura, no double comment...but I know what you mean I'm still having difficulties with commenting too! You should look into getting some rock! The neighbors might look at your strange but you will love it! Pam, yes...I agree. Buying new plants is a bit of a consolation. I hope you do not have a repeat next winter! Noelle, good point. They are always evolving and guaranteed we do not see the same things that others do when we look at them! Les, I look forward to this promised Tetrapanax post! It won't take as long as you think to fill in :) We didn't start doing anything with our backyard until about two and a half years ago. It was a big weed fest back there. Love the new plants! I think it looks really good. And some of your plants, like that tetrapanax, should grow in quickly. I know what you mean though, I have done some making over of my own, and am left wondering what was I thinking. 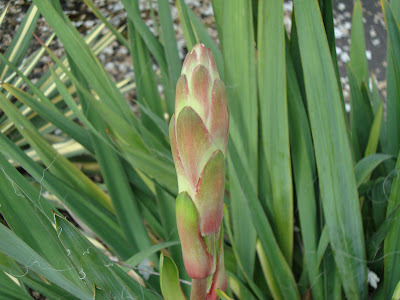 I do think I have the perfect bald spot in the garden for a new Yucca rostrata. Thinking a Cistus trip is in order.